On 18 and 19 March the Corps was delighted to welcome Salvation Brass to the island. Saturday morning, despite thick fog, the band arrived in Guernsey to the relief of those on the flight and those waiting to welcome the group to the island. A quick stop at the Corps for a welcome coffee break was followed by a short open air concert in Market Square in town. Many people stopped to listen and some great conversations were had with those who wanted to know more about who the group were and what The Salvation Army was about. This included the first outing of Praise Party, together with another favourite “Promised Land”. After a little free time in town the group returned to the hall for lunch together, followed by an afternoon of rehearsals and time sharing together in small groups. Major Noel Wright led time of devotions. This was followed by a time spent with the Corps YP Band who would feature in the evening festival in “Praise Party”, followed by a time of fellowship over food. The evening festival was well attended with a packed hall, and the congregation were ready for something a little different. The band played a wide range of pieces, beginning with the piece “Amazing Grace”, including “Praise Party” with the YP Band, “All Creatures of Our God Can Swing” featuring Tom Nock on Flugel Horn in his first outing with Salvation Brass, “They Shall Come From the East” and finishing with the festival march “Able”. 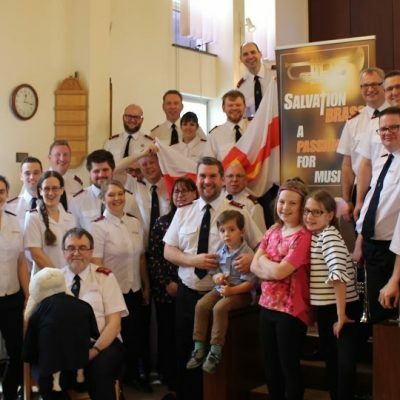 The Corps Songster Brigade also took part, singing “You Are The Light” and “Singing’ In The Heavenly Choir”, blessed with SB member Cat Thompson accompanying. After lunch a a little free time to explore the local area (the beach across the road), the band readied themselves for the final meeting of the weekend. The Corps band played before the service, and then the Band opened the celebration with “Ein Feste Burg”. Another powerful word from Major Wright challenged those attending, before the weekend was brought to a close with the band surrounding the congregation and playing Seb Farrel’s arrangement of “Total Praise” – a fitting end to a fantastic weekend of worship, music and fellowship. Both the Corps and the Band were extremely blessed by the weekend. Not only fantastic music, but the fellowship, worship, excitement and joy demonstrated lifted spirits and provided encouragement to the Corps. The band felt they hd gained much from the weekend, whilst the Corps had invested and bought into all that SB were offering over the weekend.